My second post of the evening. This time I have a card to share. A couple of weeks ago I had the Spellbinders expandable lattice dies in the shop, after I got over my cold I had a play. While playing I came up with this card. This card started life as an experiment. 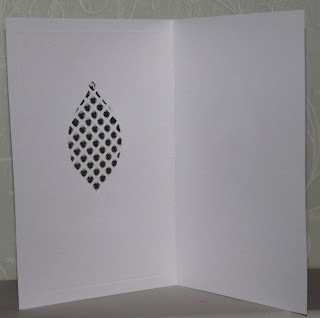 I wanted to see if a technique I learned with embossing folders would be able to be adapted and used with the lattice. First I cut a shape from a cereal box 5 times and glued them together. The shape used in this card Spellbinders 2012 Heirloom Ornament. To have the shape cut out in the lattice you make your cutting sandwich as follows ( I used a bigshot) white base plate, clear plate, an A5 card folded (A4 card folded in half) with right side inside and the lattice inside the card with the cutting side to the right side of the card, cereal box shape then clear plate. With this technique you don't have a hole cut, with a lattice glued behind it. That's all for now. Let me know what you think I do love reading your comments. It's that time of year again when the clocks go back. I don't know about you but I'm not keen on the dark nights.... it's not yet 6pm and it is already dark outside. I'm not sure why they have called it eBosser because not only will it emboss it will cut, and not just the thin dies such as Spellbinders or Cheerylyn dies, it will also accept Sizzix thick dies too. How amazing is that. The eBosser will both cut and emboss for all your crafting needs, including fabulous frames, beautiful backgrounds and stunning borders. Here are some of the reasons we love it! You’ll receive all the cutting and embossing platforms you need in the box, so you’ll be able to use all your dies and embossing folders in the machine straight away! 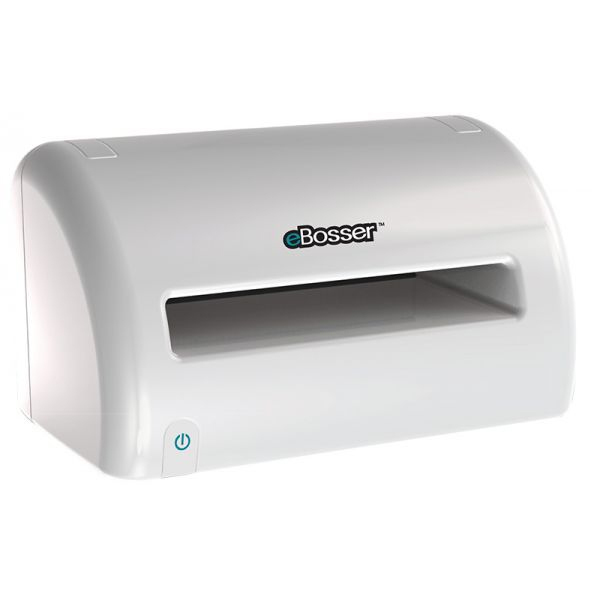 The eBosser will cut through multiple layers of fabric in one pass and also cut or emboss leather, wood and metal with ease too! Emboss edge-to-edge with embossing folders up to A4 in size! You’ll even get a free A4 embossing folder included in the box! And that's enough to bring sunshine to any crafter's craft room on these dark nights. Well that's all for this post. Thank you for stopping by. See you again soon. I'm feeling a bit sorry for my self this morning, even though the sun is shining and not a cloud in the sky. I should be out and taking the dog for his walk but I am so bunged up and full of cold I couldn't face taking him. So my dear old hubby has taken him instead. So instead of walking I'll share a couple of cards with you. 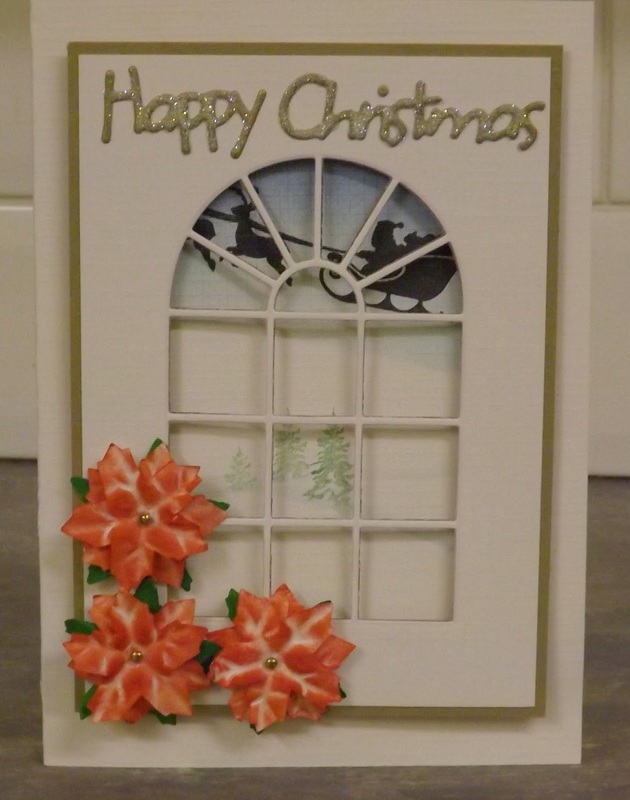 Here I have used a Cheery Lynn window die. I stamped and sponged a snowy scene on my base card, then layered up the window with the poinsettia. 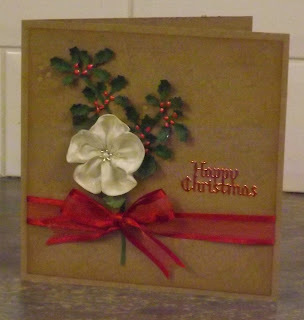 I have since made this card with a red border and white poinsettia that have glamour dust on them, really does look festive. Unfortunately I didn't take a photo of it so you are going to, have to use your imagination I'm afraid. This is a more recent card with a Christmas rose made from ribbon. For a change I have used Kraft card stock for my base card. 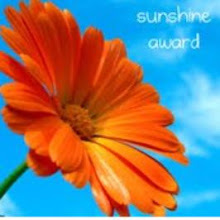 I like using this but I know some people don't like it. It would be a very boring world though if we all liked the same things. You can't see from the photo but I have stamped holly in the background with old paper distress ink, it is quite subtle which I like. Well that's all for this post. Thank you for stopping by. I will see you again soon. I'm off now and have some hot honey and lemon drink. I have more cards to share with you as promised. Here I have used a Rudolf stamp from Hobby Art and some punched snow flakes to form the wreath on a snow flake stamped background. 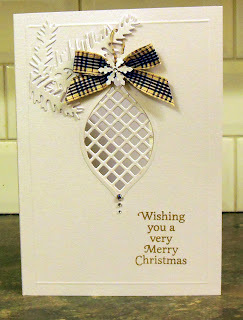 For this card I used the boot stamp from the Crafters Companion Christmas card kit. I have stamped a holly background and holly punched shapes for the wreath. Well that's all for this short post. I will see you again soon. It's one of those games where you have to get the little balls in the holes. These are so much fun to make. And difficult to put down when you have received one. These three cards are made using the new Holiday tree die from Spellbinders. Ok that's all for this post. I have some more cards to share tomorrow. My husband Grahame and Son Paul have completed the Manchester to Blackpool night bike ride. We saw them off at the Trafford Centre at 12.00 midnight. A BIG THANK YOU TO EVERY ONE WHO HAS SPONSORED THEM.